Thousands of trade unionists and community campaigners marched through London today to show that they weren’t about to sit back and let the Con-Dem cuts destroy our services. 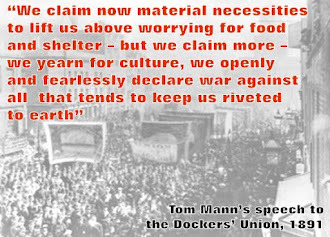 With marches taking place in many other cities, including over 20,000 in Edinburgh, October 23rd shows that the trade union movement is, at last, starting to turn words into action. 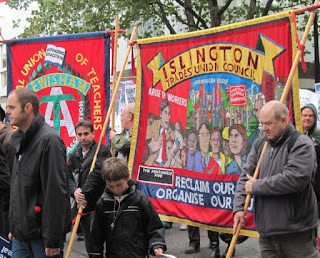 But today’s London protest would only have been the indoor rally at TUC Congress House if it hadn’t had been for the RMT, FBU, PCS and National Shop Stewards Network organising to make sure a march also took place. I was proud to help make sure that the NUT also gave support, along with other London trade unions like the UCU, UNITE and CWU. 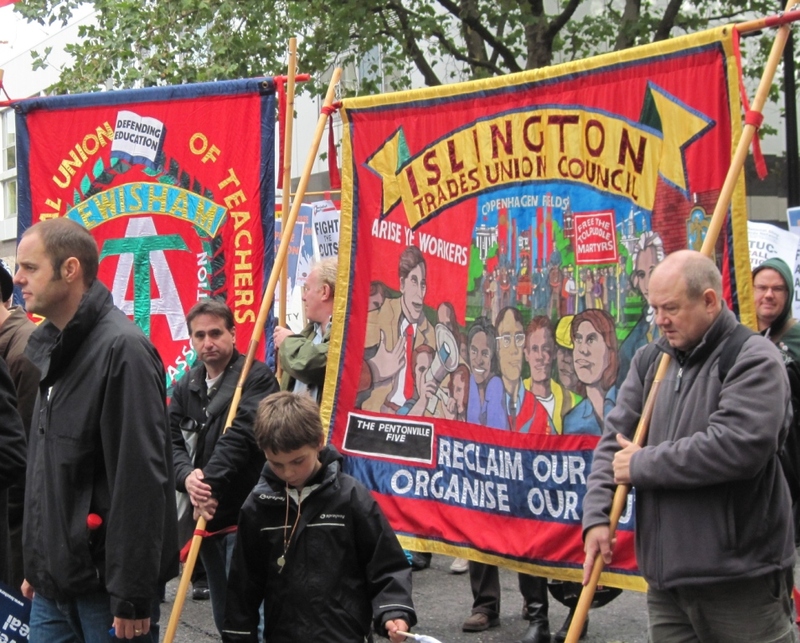 Banners and flags from trade union branches and trades councils from across London were on the march, led by striking members of the FBU. Bob Crow and Matt Wrack, General Secretaries of the RMT and FBU made stirring speeches at the rally that packed into Bedford Square. Speaking for the NUT, I talked of the worker who had grabbed my leaflet at Euston, saying “at last someone is doing something”. But there must be 1000’s more workers like him angrily watching the news, seeing their jobs and benefits cut, also looking for a lead. Today’s march can help serve notice on the Tories that it isn’t just Greek or French workers that fight – we’re going to fight in Britain too. Today’s strike by London’s fire-fighters shows how to stand up against the bullies and axemen. We have to unite communities, build anti cuts alliances, link together workers, students and the unemployed, but, above all, united trade union action is vital. I called for the National Executives of the unions that are ready to battle to meet together as soon as possible and name the date for a national demonstration BEFORE Christmas – not waiting until March like the TUC. It’s no longer time just for words, it’s time to act. We must also meet and agree the day for a 24-hour strike – and organise co-ordinated ballots to make sure it takes place. It’s time to make this Government think again about their vicious cuts!